Students from 35 countries around the world will soon call Ballarat, Gippsland, Berwick and Brisbane home as Orientation Week (O Week) kicks off at Federation University Australia. The number of international students studying at FedUni has more than doubled in 2019, compared to the previous year. Almost 900 international students from as far afield as Austria, Cambodia, France, Kuwait, Norway and Saudi Arabia will study at FedUni this year. This includes 35 international students enrolled at the Churchill campus in Gippsland, mostly in nursing – up from four last year. 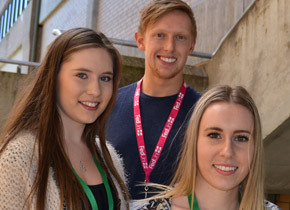 The Mt Helen Campus has 402 international students enrolled so far, while Berwick has 256 and Brisbane has 173. Living on campus is also proving popular, with a large number of domestic and international students moving into FedUni Residences this week. This includes up to 500 students in Ballarat, almost 150 students in Gippsland and nearly 100 in Berwick. O Week gets under way on Monday 25 February with social, career, finance and mentoring events and support for students across all FedUni campuses.